A Health Ray Sun Lamp that uses two Carbon rods connected to the mains via a cooking element, this acts as a safety load. When the carbons touch they create an arc of light that is very high in Ultra Violet light, making it ideal for a sun lamp. This unit would not only produce lots of smoke but the rods would continually need adjusting, as they quickly deteriorate when in use and burn away. I too remember as my mum called it “sun ray” treatment I was quite a sickly baby/toddler and contract some virus at first thought it was rheumatic fever, then polio never did ask her what it was. I remember it was at Morrill Street clinic off Holderness Road in Hull. Can remember the white tiled room a small wooden stool and the dark swimming like goggles to protect my eyes and the smell from the lamps. No wonder of my baby photo are off the child with a permanent all your round tan. I had one of these lamps during the 1950's and 60's, I may even still have it somewhere although last time I saw it it was quite rusty. 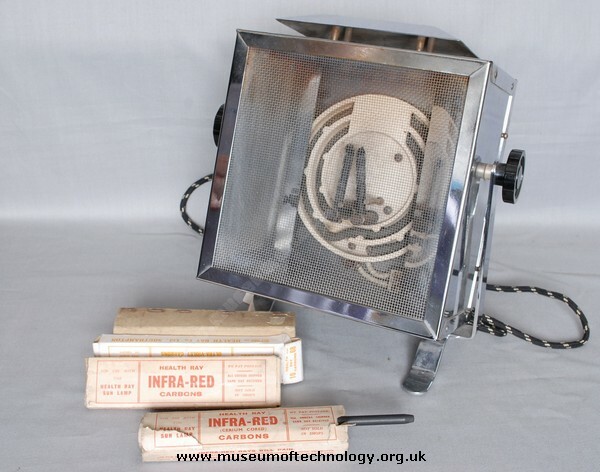 They were a cheaper version of Sun ray lamp, sold in competition to the Philips sun-ray lamps (which did not use an open carbon arc). The element was used as a ballast for the carbons and also provided infra heating. The carbons would be touched together, (there is a knob on the back of the unit to do this) and spark, then opened to allow an arc to form in a small gap between the ends of the carbons. There was no automatic feed on the carbons so you soon had to adjust the gap as the carbons burnt away. Cinemas also used carbon arc lamps back in those days but were much more powerful and had motorized feeding on the carbons. The sun lamps would run with a 5amp fuse I think the element was around 500 watts. They were not very powerful on their own, but of cause if several were used together at a treatment center there would be more potential for skin damage. In the 1950s I might have been 6 or 7 my mum used to take me to the clinic in Edlington Doncaster for Sunray treatment twice a week, it is true you never forget that horrid smell and those goggles, I don't even know why I had to go, not even sure if it did any good, I'm now 67 and still to this day don't know why has children we was subject to this treatment other than being Guinea pigs for what ever reason. I can remember visiting East Ham Clinic in the early 1950s when I was about 10. As someone above said, the smell and the noise stays with you. I was sent for this 'treatment' because I had weak ankles. I am not aware of any mole problems but having read other comments I am going to have a thorough check. if I should be worried about the effects. In the earl 1950s in Indiana, USA we had one of the carbon-arc lights. In winter we (3 boys) would get Saturday night treatments amounting to 15 minutes; 7 minutes front and back in underwear. I never was in the sun much but at 65 got melanoma which was caught early and cured/ excised. Dr said we get skin damage in first 20 years. After that means nothing. I attended a Clinic in Hull (Coltman Street) for Sun ray treatment in the 1940's-50's I can still smell the room (similar to the smell of a photocopier machine) I sat naked with other boys for ten minutes wearing rubber goggles. It was a scary experience for a young child. The treatment was, I was told, to give an extra dose of Vitamin D. I had been suffering with a TB lymphatic gland. As children in the mid 1940s, our mother used to take us to a sunray clinic in Blackpool. We stripped to our pants, wore goggles, and walked round and round under UV lamps, holding mother's hand. I can still vividly recall the smell of the lamps. I am now being treated for metastatic skin cancer following discovery of a malignant mole in the middle of my back. I feel this may be related to my sunray treatment as a child. I lived in Haslemere Surrey as a small child and remember being taken to have this treatment. I'm not just where we went possibly Guildford if it wasn't in Haslemere. I was probably around 4 years old. We sat around the big lamp in our underpants with green goggles on. Apparently the treatment was good for us and gave us sunlight for our bodies. IN 1955 AGED 5 YEARS I USED TO GO TO OUR LOCAL HOSPITAL TWICE A WEEK AND SIT IN FRONT OF ONE OF THESE LAMPS WITH GOGGLES ON,I SUFFERED WITH "BAD CHESTS" AND THE DOCTOR HAD REVERED ME. DID IT WORK!! AS AN ADULT I HAVE NEVER SUFFERED WITH CHEST PROBLEMS (CROSSED FINGERS!) AS A CHILD I HATED GOING AND THE LAMP AND THE HOSPITAL FRIGHTENED ME. I DO SUFFER WITH S A D IN THE WINTER MONTHS, IS THIS A RESULT OF THE HEAT AND LIGHT I WAS SUBJECTED TO?? I have one even older still at my house . we to were made to sit in front of it every day as a health lamp. I have had breast cancer ??? wonder if a connection. My Father bought one of these, identical to the one illustrated. Myself and my younger sister and brother were "treated" with it for a limited time; which was strictly observed; about once a week. I used to suffer badly from ear infections and had extra treatment, as the heat used to ease my pain. I am now 73 years old and having regular treatment for Ultra Violet skin damage. I have never been a "sun worshipper" and as a serious recreational sailor always covered, regardless of comments from sun tanned fellow sailors. My Doctor says that damage was probably done as a child. Only this week, I remembered this machine and wondered if it may be responsible! My mother used this daily, 10 min. on her front and 10 min. on her back. She hoped, in smog-afflicted London, that it would help her general health as she had bronchitis regularly and a slipped disc for the best part of a year, which had been treated by a plaster cast being placed around her torso. The sun lamp was used in an attempt to build her up after that, I think. I don't recall smoke, though I do remember the buzzing noise and the knowledge that it was a slightly dangerous object and procedure. A more dangerous and unhealthy appliance would be difficult to imagine ! I assume that you would at least have to wear goggles when using it.